When I was growing up in Bangkok in the late 60’s, Thailand’s beaches were not yet much of a tourist destination. Even Pattaya Beach was unspoiled and seemed barely used (I know that will be beyond the imagining of anyone who first saw it from the late 70’s on). We used to drive down there for weekends. I’d spend hours creating tide-based water systems: it was a never-ending battle to keep the water moving just so, whether the tide was going out or coming in, but I found that more interesting than building sand castles. You could also pay for horse rides on the beach, something I felt marvelously privileged to do once per trip. Clinging proudly to the horse’s mane, trotting along the beach as the horse man jogged alongside, I was in heaven – in spite of the insides of my bare knees being rubbed raw from riding on a sweaty old saddle in my shorts or bathing suit. Once, when my parents wanted to get far away from it all, they and a group of friends hired a fishing boat to take us out to one of the little islands off the coast. This was minimally equipped for visitors: three-sided palm-thatched shacks built a few few feet above the ground where the beach met the sparse jungle, food supplied by the villagers who lived the other side of the island. I hunted for shells, played in sparkling sand, and swam in crystal blue waters – once right around the point to the inhabited side of the island! Back in Bangkok, I was in the pool just about every day and for hours on weekends, playing “Marco Polo” with the swarm of American kids who lived in our apartment compound, and diving for coins even at the deep end. 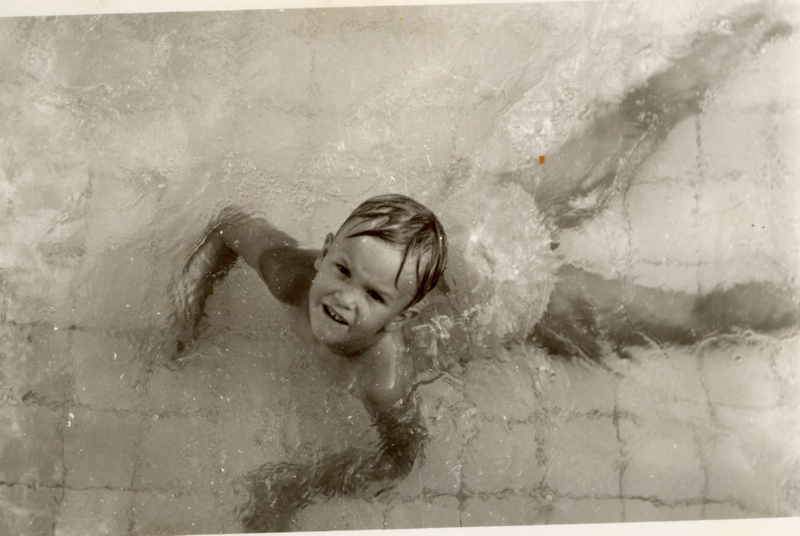 I was a decent swimmer and loved water in any form, though I was afraid of big waves. This was a handicap when my father and I stopped over in Hawaii on our way back to the US when we left Thailand (1971) – I was only 9, and all the waves there looked big to me. My dad’s idea to “cure” this fear was to throw me into the surf. A particularly large wave promptly threw me back, tumbling me end over end, blinding me with foam and filling my ears and nose with sand. After that, I was afraid of anything larger than a one-foot swell. Then we moved to Pittsburgh, where there are no beaches and I rarely even got near a swimming pool, though I did have a few opportunities to play in creeks at a friend’s farm in western Pennsylvania. I didn’t really see a beach again until we moved to Connecticut – whose beaches were better than no beaches, but far from my memories of Thailand. In the following years I got still further from sea level, attending high school up in the Indian Himalayas. Coincidentally, my dad and stepmother moved back to Thailand during this time, even living for a year or so in the same apartment complex, Red Rose Court, where I had lived with my dad and mother 10 years earlier. The pool was still there, but not the swarm of kids. I never went in it. 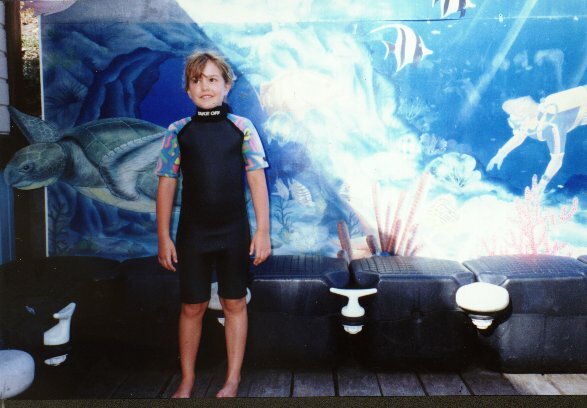 But I did have one significant ocean experience. During a long winter vacation from school, my father and I did a scuba diving course together. That’s a story unto itself, but the final qualifier was a weekend of open-water dives from a boat off Pattaya. By this time my eyesight was so poor that I had to have a dive mask with prescription lenses – which, fortunately, optometrists in Bangkok were well able to make. This made it possible for me to see the wonders under water, which I enjoyed far more than waves and sand. In early 1980, I took part in the Winter Tour, a six-week trip around India run by Woodstock School to keep students busy during the long vacation, especially those who were in India on a one-year “package program” and would not be returning to their families at Christmas. We visited several beaches around India – Goa, Kovalam, Trivandrum. By this time I was not enthusiastic about sea swimming: I couldn’t see without my glasses, but was afraid to wear them into the water and risk losing them in rough surf. One afternoon at the beach some friends persuaded me to swim with them, leaving my glasses in care of other friends on the sand. When we finally came out, dusk was falling and our friends had returned to the hotel, carefully taking all our stuff with them – including my glasses. The route back to the hotel was a steep, narrow path, ever less visible in the dimming light. I had to walk with one friend before and one behind, each holding my hand. That walk was terrifying for me; I still occasionally have nightmares about fumbling, near-blind, without glasses. This consolidated my fear of swimming in any sort of open water, and I’m no longer very keen on pools, either. Then came twenty years of Italy, with Enrico. On our first visit there together in the summer of 1988, we were traveling around northern Italy, and stopped off to meet some friends of his at a beach in Liguria. 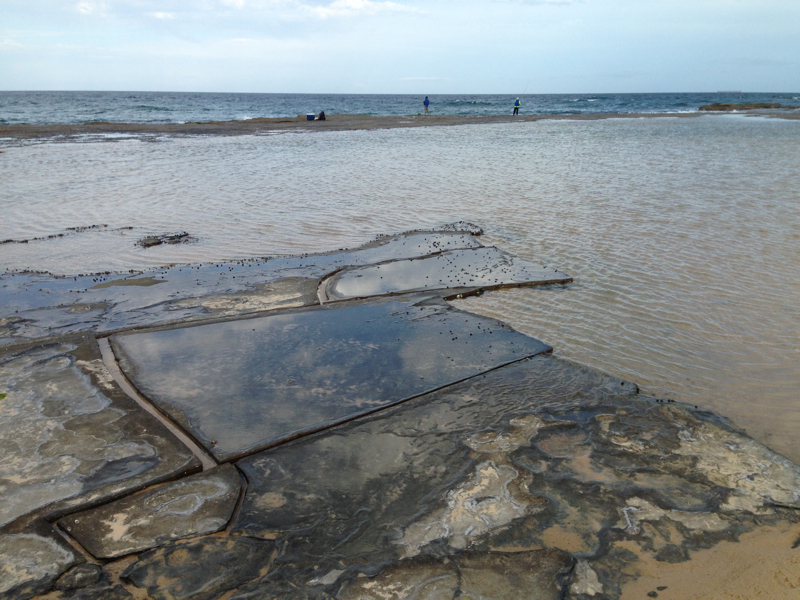 I was deeply disappointed: this particular beach had no sand at all, just a scree of smooth stones. People were lounging under regimented rows of umbrellas, with little tables attached to hold drinks and snacks. The water was chilly and uninviting, so they seemed to be there mostly to lie in the sun and chatter with friends. To my horror, it turned out that many Italian beaches – certainly the most-frequented ones in central and northern Italy – are set up like this with “lidos”: rows and rows of umbrellas and lounge chairs, meticulously maintained and rented by the day, week, or month. Families return to the same beach and even the same umbrellas year after year – the front row, closest to the water, being the most expensive. 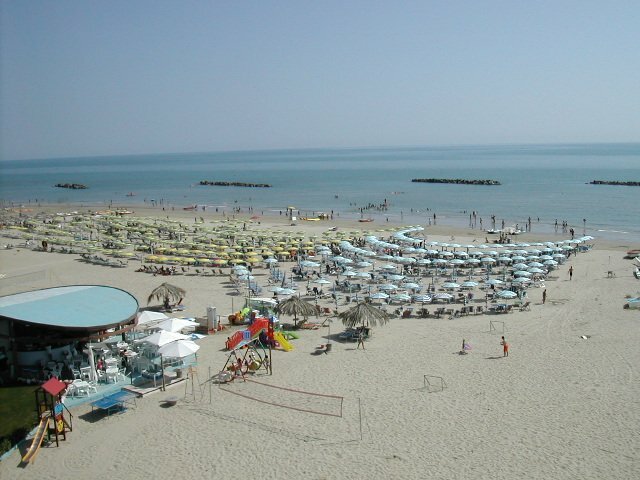 On the more popular beaches such as Rimini, there may be 10 to 15 rows of umbrellas; those furthest back have effectively no view of the water. During peak vacation periods, all of these umbrellas are rented: it’s as if every Italian family moves itself into a very small living room, elbow to elbow with other families doing the same. Some bring radios. All have cellphones. The lido owners also take it upon themselves to entertain their guests with pop music from speakers on poles along the beach. Cars cruise along the lungomare (beachfront road), blaring advertisements for local events and businesses from huge loudspeakers mounted on their roofs. An Italian beach vacation is anything but peaceful and relaxing. Like many Italian families, Enrico’s parents had a seconda casa: a second (vacation) home, which they had already owned for decades. Theirs was in Roseto degli Abruzzi, a small town on Italy’s central Adriatic coast which has not much reason for being, that I can see, except as a holiday destination. It was a two-bedroom apartment at the top of a four-story building, overlooking the beachfront road and then the beach (the view above is from the balcony). This particular patch of beach was less developed when we first started going there in 1990, with just five or six rows of blue and white umbrellas and chairs rented out by a neighbor in the building, whose main profession was plumbing. Over the years he expanded his lido concession with more rows of ombrelloni, a snack bar, changing rooms and showers – which brought him up to par with the competition. The beach at this point was wide by Italian standards, protected by breakwaters and periodically replenished with sand trucked in from elsewhere. Its gentle slope with shallow water for a long way out made it ideal for little kids, so it was a great place for our daughter Rossella to spend vacations with her parents and doting grandparents. Cramming us plus the parents plus Enrico’s brother and his girlfriend into the tiny apartment for weeks was not ideal, nor was spending the colder Easter and Christmas seasons in Roseto when Enrico’s parents eventually retired there for health reasons… but that’s another story. 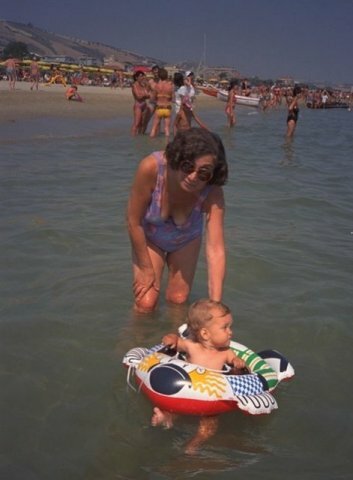 There were practically no waves on this part of the Adriatic coast, so I felt safe to go in the water a bit (wearing my glasses), but it was murky and uninteresting compared with the crystal waters of my childhood in Thailand. I built in the sand with Ross a bit, but there wasn’t enough tidal variance in water level to make hydraulic engineering interesting. And I grew very tired of being trapped at our rented ombrellone, overhearing the conversations of randomly-chosen neighbors for days on end. There are unpopulated, unspoiled, natural beaches in Italy – we saw a few, passing in the train from Milan to Abruzzi. I’m told there are far more in the south, but we never got to any of them. Italians are creatures of habit: Stessa Spiaggia, Stesso Mare. During the dot com boom, when we seemed to have money to burn, and I needed desperately to take a vacation that I actually found relaxing, we made a few trips to the Caribbean: Martinique, St. Maarten, and St. Barth’s. The most beautiful beach we saw among this (admittedly limited) selection of islands was the nudist L’Orient Bay on St. Maarten. In Martinique, I had brought my old dive mask along, so was able to go on a brief, guided dive. The underwater scenery was more rock than coral, overall more gloomy than my bright blue and gold memories of Pattaya Bay. The water was certainly colder – we needed wetsuits. 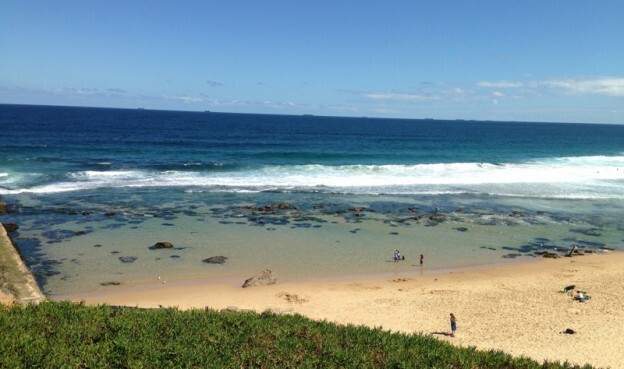 Some Australian beaches I captured on video here. This entry was posted in bio, Italian culture and tagged Australia, Italy, Thailand on December 15, 2013 by Deirdre Straughan.